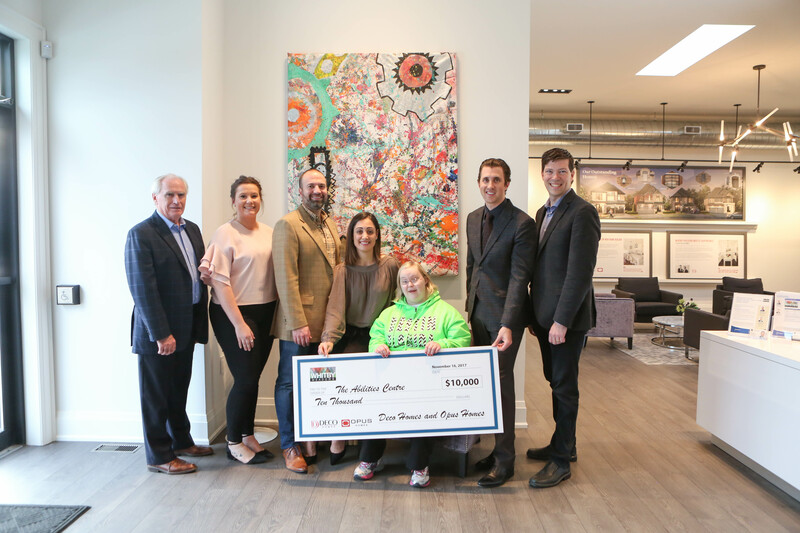 OPUS Homes, in conjunction with DECO Homes was proud to make a donation to Abilities Centre’s Thrive Art Program, as a gesture of thanks for the contribution of art made for the Whitby Meadows Presentation Studio. The program’s artists created an art piece inspired by the idea of community, using some innovative materials, such as wheels, balls, as well as their hands and brushes. The result is a colourful, whimsical piece that is hung with pride at the OPUS / DECO Whitby Meadows Presentation Studio. The art display is comprised of a large art piece hanging within the studio, a video of the Thrive Artists creating the piece, along with a print art installation, from selected original works. It all comes together to create an environment that speaks to the sense of belonging that the community of Whitby inspires in us. The donation presentation took place at the Whitby Meadows Presentation Studio, Thursday, November 16th, at 3pm. The Thrive Artists, Abilities Centre Executive Team including Executive Director, Leo Plue, along with representatives of the media were in attendance. The art will be on display at the OPUS/DECO Presentation Studio at 4120 Coronation Road, Whitby. Photo, from left to right: Abilities Centre Executive Director, Leo Plue, Program Coordinator, Kelsey Ford, OPUS Homes Principal and Legal Counsel, Michael Ronco, OPUS Homes Principal, Andrea DeGasperis-Ronco, Thrive Art Student, Ashley Ferguson, DECO Homes President, Corey Brown, and Whitby West Ward 2 Councillor, Chris Leahy. Previous PostPrevious Origins Is Now Open Offering New Homes in Brampton!